If you coming from the north, Tulsa, Broken Arrow, North Bixby, Owasso or Jenks toward 129th and Memorial in Bixby you will pass the Rib Crib in Bixby and we are just south of them, in the shopping center with Spartan Family Dinner and Village Cleaners. We are located right in the middle. If you are coming from the south, Bixby, Glenpool, Mounds, or Haskell as you go north through the intersection at 131st and Memorial we are three blocks north on the west(left) side of the road. We aslo offer pick-up and delivery in the Bixby and surrounding areas. If you have trouble with unhooking and hooking up your Computer we can help, we offer in home setup of computers, monitor and printers. We also will come on site for wireless setup or router configuration. Rampart Computers, located in Bixby Oklahoma, provides onsite computer repair for your home or business, drop off services, upgrades, networking and much more. Service is defined as an act of helpful activity; help, aid. How many computer “service” centers actually provide service? Sure, they may fix your system, but did they help explain anything? For example, what cause the computer to keep shutting down and what did the technician do to prevent it from reoccurring? Rampart Computers truly is your computer service center. We are more than a name with a slogan. Our main objective is to assist you in understanding what happened to your computer. We then assess the situation to ensure that appropriate steps are taken to prevent the situation from happening again. In addition to fixing the problem, we walk you through the process so that you understand the problem and how it was resolved. For info on our Tulsa computer repair and service. For info on our Bixby computer repair and service. 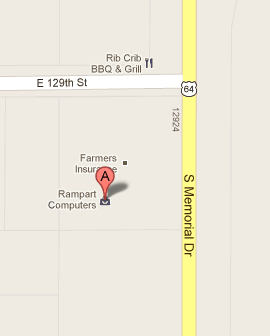 Rampart Computers provides computer service and computer repair for the greater Tulsa area. We only use quality computer parts and supplies. Rampart Computers Your IT department.